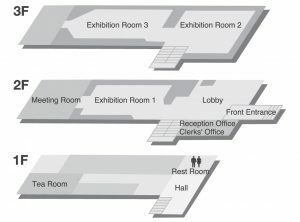 here are special holidays for exchanging exhibits. 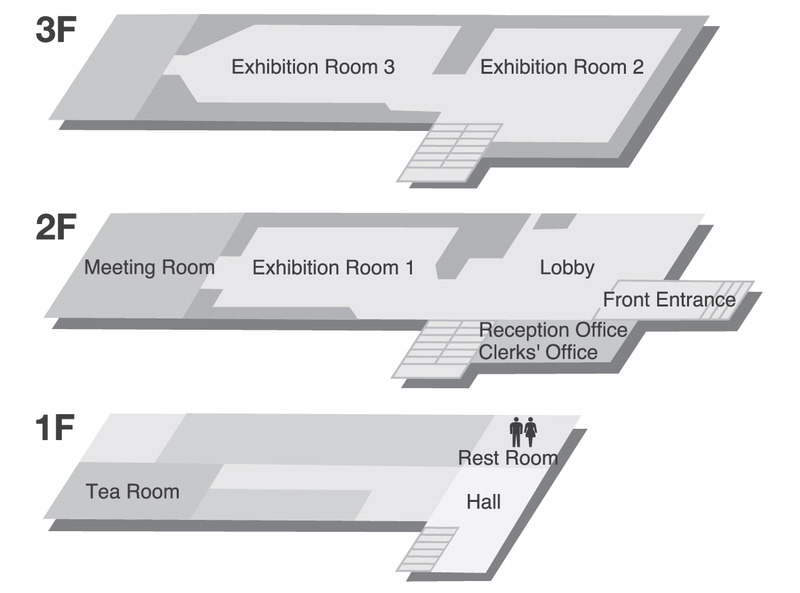 ・Admission fees are changed during a special exhibition etc. ・We have stipulations to exempt admission fee. For more information, please ask us. Take the tram of No. 2 route for Yachigashira and get off at Aoyagi-cho. It takes 7 minutes to walk to the museum through Hakodate Park. Permanent exhibits in this museum change every year and works garnered based on a specific theme are displayed. 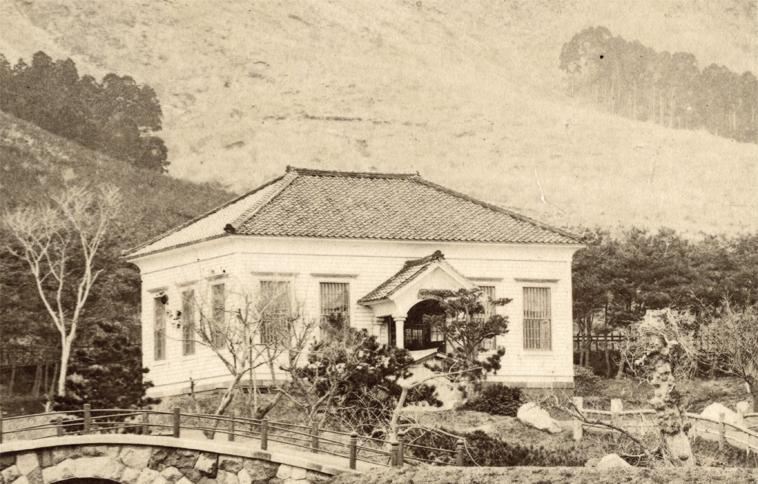 1875　In June, Hokkaido Products Exhibition Office was set up inside the Hokkaido Development Agency Tokyo Branch Office. 1876　In February, Hokkaido Products Exhibition Office was renamed Tokyo Provisional Museum of the Hokkaido Development Agency. 1878　In March, construction of Hakodate Park started.／In May, construction of a museum inside the Hakodate Park was decided. 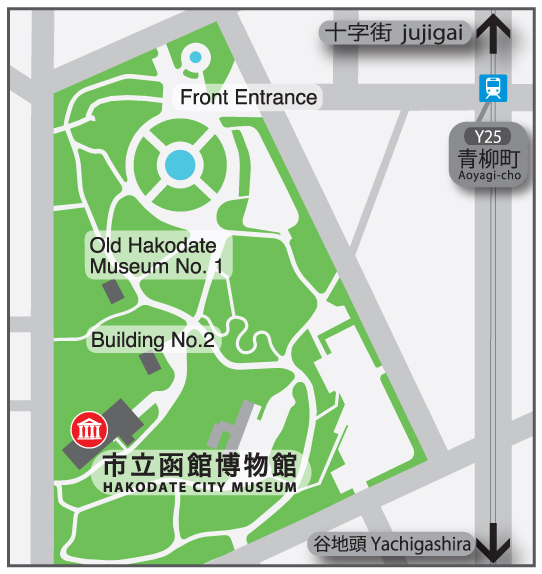 1879　In May, Hakodate Provisional Museum (Building No.1) was opened.／In November, Hakodate Park was opened. 1881　In May, Tokyo Provisional Museum of the Hokkaido Development Agency was closed and all its collections of displays were transferred to Hakodate Provisional Museum. 1882　In February, due to the abolition of Hokkaido Development Agency, Hakodate Prefecture had jurisdiction over the museum. 1884　In August, the second museum (Building No.2) was opened in Hakodate Park. 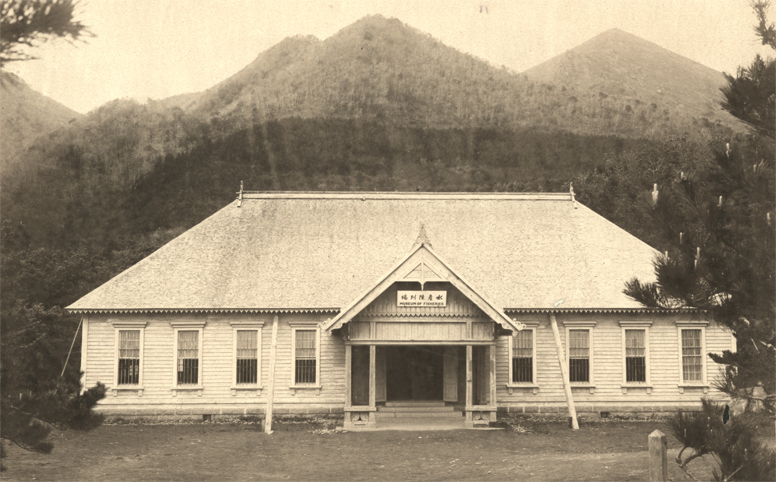 1886　In January, Hokkaido Government had jurisdiction over the first and second museums. 1891　In January, the second museum (Building No.2) was used as a commercial gallery of commodities made in Hokkaido Hakodate Commerce School.／In July, Suisan Chinretsu-jo (where everything related to fisheries is displayed.) (Building No.3) was opened under the jurisdiction of Hakodate City. 1892　In March, the first museum (Building No.1) was used as a commercial gallery of commodities made in Hokkaido Hakodate Commerce School. ／In April, Building No.1 & No.2 of the museum were renamed Commercial Gallery Affiliated with Hokkaido Hakodate Commerce School. 1895　In March, Suisan Chinretsu-jo (Building No.3) was sold by the government to Hakodate City and became Hakodate City Suisan Chinretsu-jo.／Hokkaido Hakodate Commerce School was dissolved and Hokkaido Hakodate Jinjo Junior High School (present Hakodate Chubu High School) took over the commercial gallery.／In June, the commercial gallery was sold by the government to Hakodate City. Later, it became three Suisan Chinretsu-jo: Building No.1, No.2 and No. 3. 1901　In April, Suisan Chinretsu-jo Building No. 3 was closed. 1932　In August, Suisan Chinretsu-jo Building No.1became Fisheries Pavilion. Also Suisan Chinretsu-jo Building No. 2 became Indigenous People’s Pavilion. 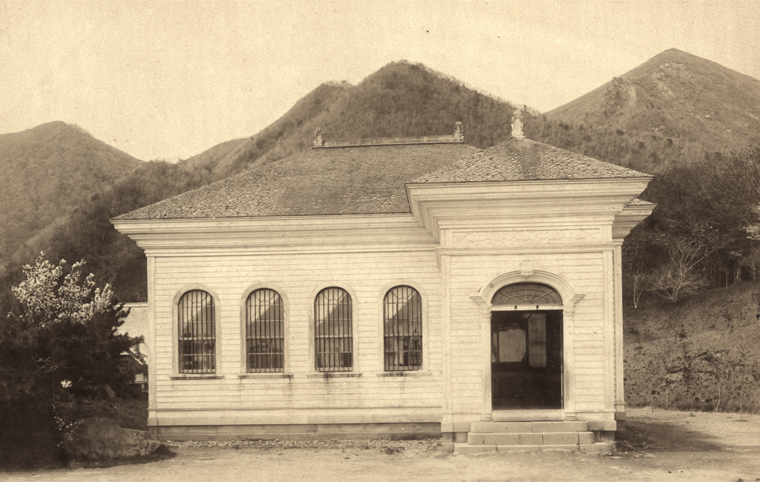 1943　In April, the Fisheries Pavilion and the Indigenous People’s Pavilion became attached to Hakodate City Library. 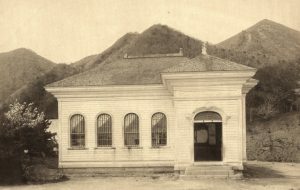 1948　In July, an ordinance to set up Hakodate City Museum was approved and an office was opened at the Hakodate City Library. 1950　In December, the construction of the museum started. 1955　In June, Tourism Pavilion at the Northern Sea Exposition was opened as the Goryokaku Branch of Hakodate City Museum. 1963　In July, the Fisheries Pavilion, Indigenous People’s Pavilion and Old Kanamori Yobutsuten were designated as Hokkaido cultural assets. 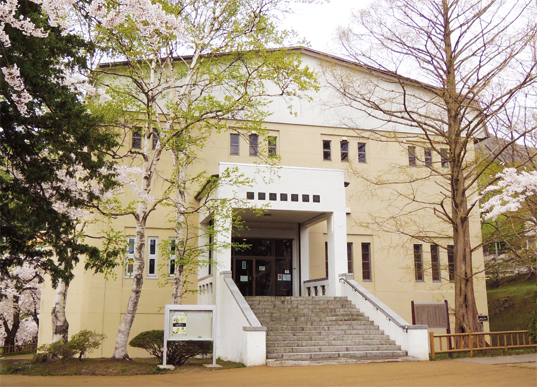 1966　In April, the main building of Hakodate City Museum was opened. 1969　In November, Hakodate City Museum of Local Materials (Old Kanamori Yobutsuten) was opened. 1970　In October, Supporters’ Club for Hakodate City Museum was established. 1982　In September, Hakodate City Northern Pacific Fishery’s Document Museum was opened. 2000　In October, after the renovation was completed, Hakodate City Museum of Local Materials was reopened. 2007　In November, the Goryokaku Branch of Hakodate City Museum was closed. It was opened on May 25, 1879. It is the oldest museum existing in Japan. The museum is a one-story, Western style, tiled-roofed, wooden building which covers approximately 108 square meters . The outside walls are painted white and the windows can be opened up like sliding doors. At the entrance, you’ll see the North Star (the Pole Star), which is a symbol of Hokkaido Development Agency. When the museum was opened, there was a Western style wooden handrail and a five-storied round show case in the middle of the building. It was opened on August 11, 1884. The building with about 117 square meters was a one-story, Western style wooden building with a zinc-lined roof (originally, with a straight-grained cedar wood roof). The outside walls were painted white, whereas the arc and the pillars at the front entrance were blue, the window frames were yellow, and the crest boards were white, very rich in color. At the entrance, there was a Corinthianesque decorated pillar and a semicircular fanlight. The upper part of the window was semicircular and the lower part was opened up and down with a balance weight. It was opened on July 1, 1891. This gallery which covered an area of approximately 317 square meters is a one-story, Western style wooden building. It has a lot of windows to gather in natural light and ventilation . In this gallery, which was managed by the Hokkaido government, collections related to fisheries were displayed. In 1895, it was sold to Hakodate City and merged with the other two buildings in order to be reorganized as Suisan Chinretsu-jo Building No1, No.2 and No.3. Afterwards, Building No.3 was closed and demolished in 1901.